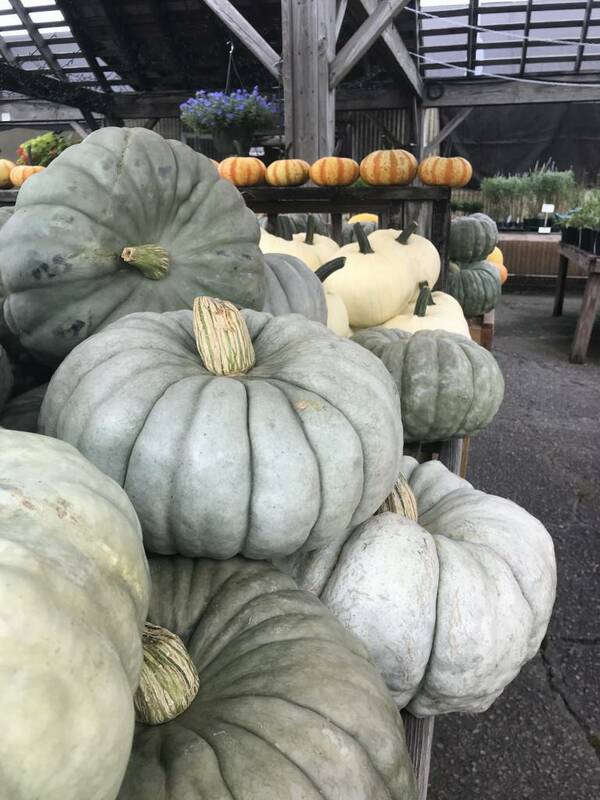 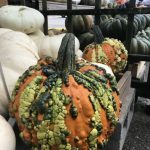 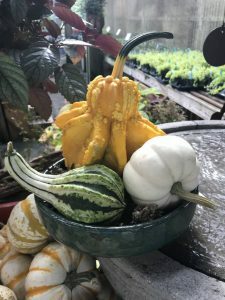 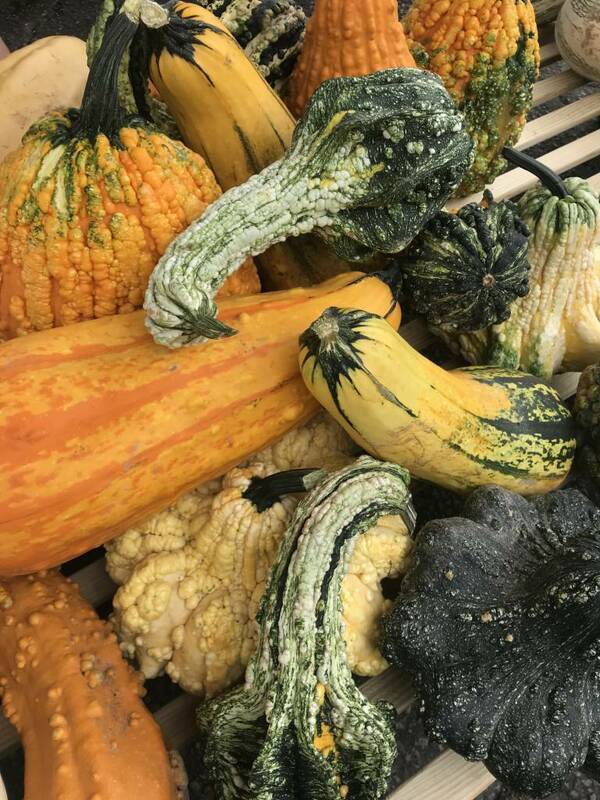 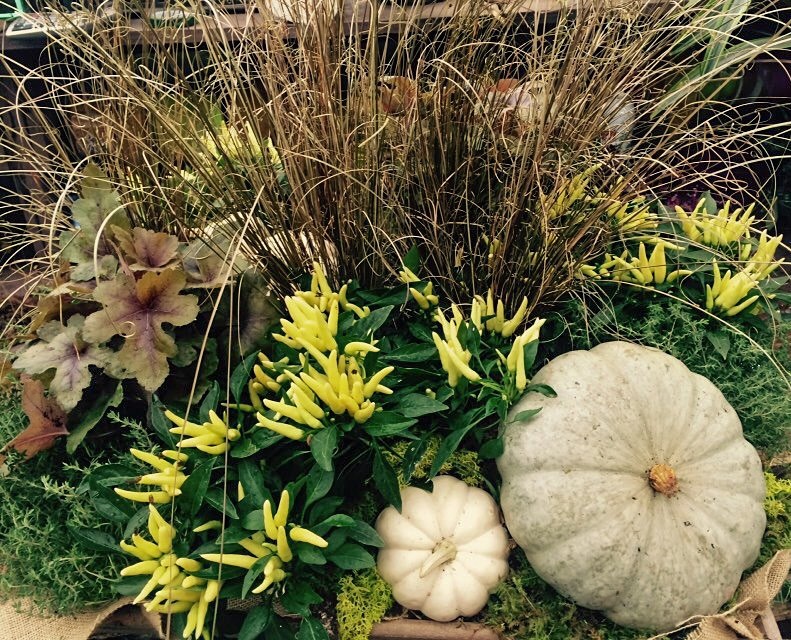 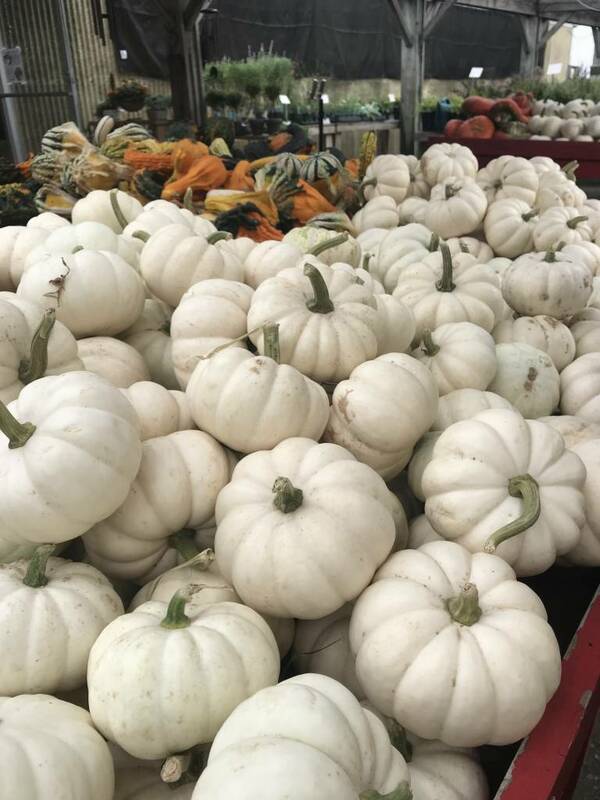 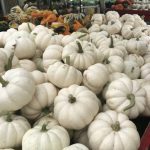 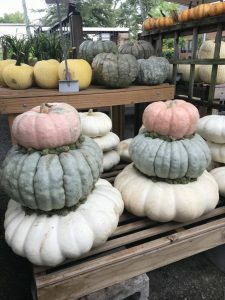 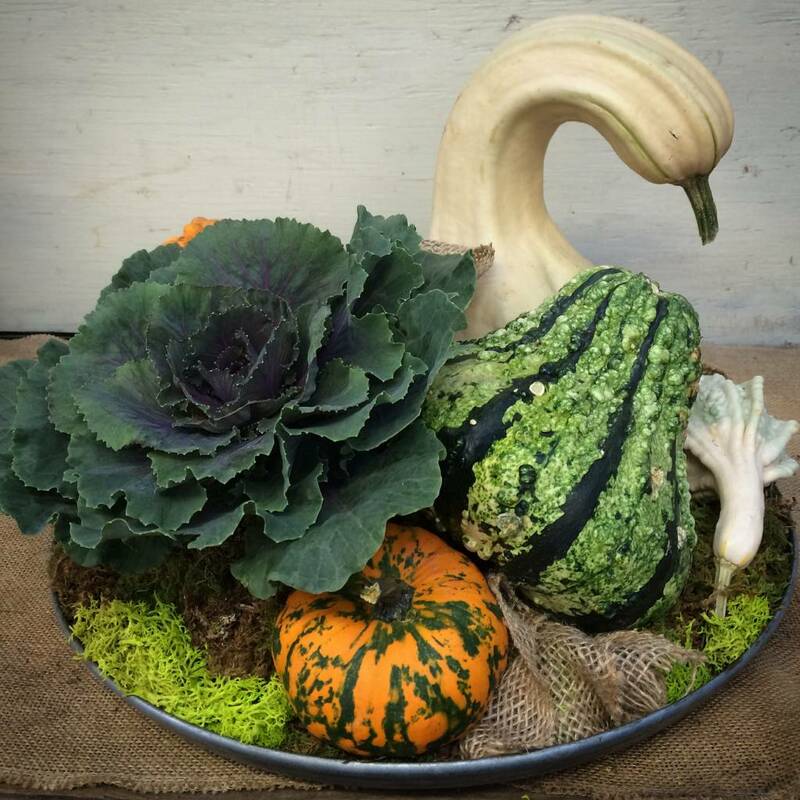 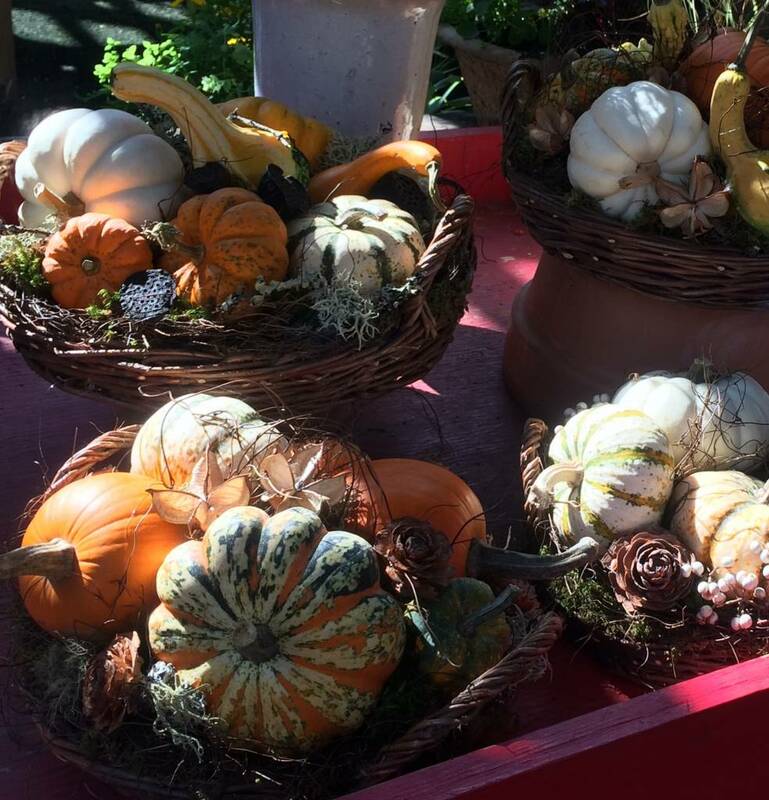 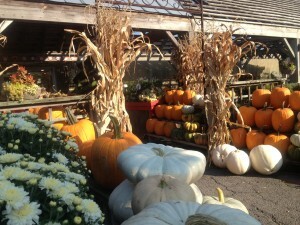 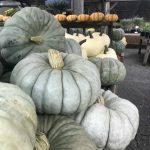 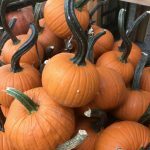 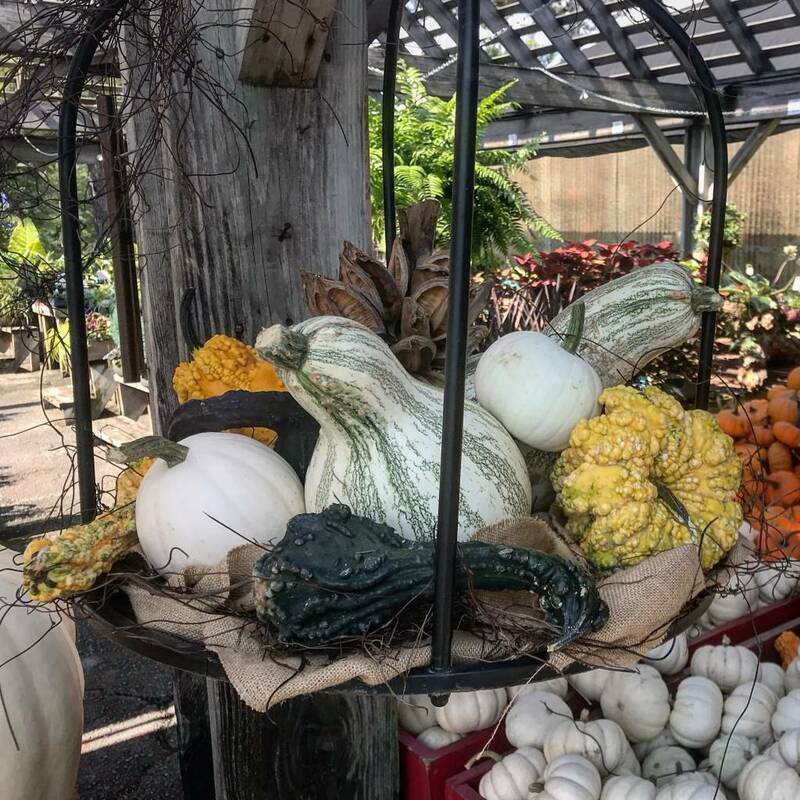 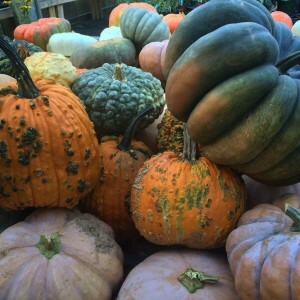 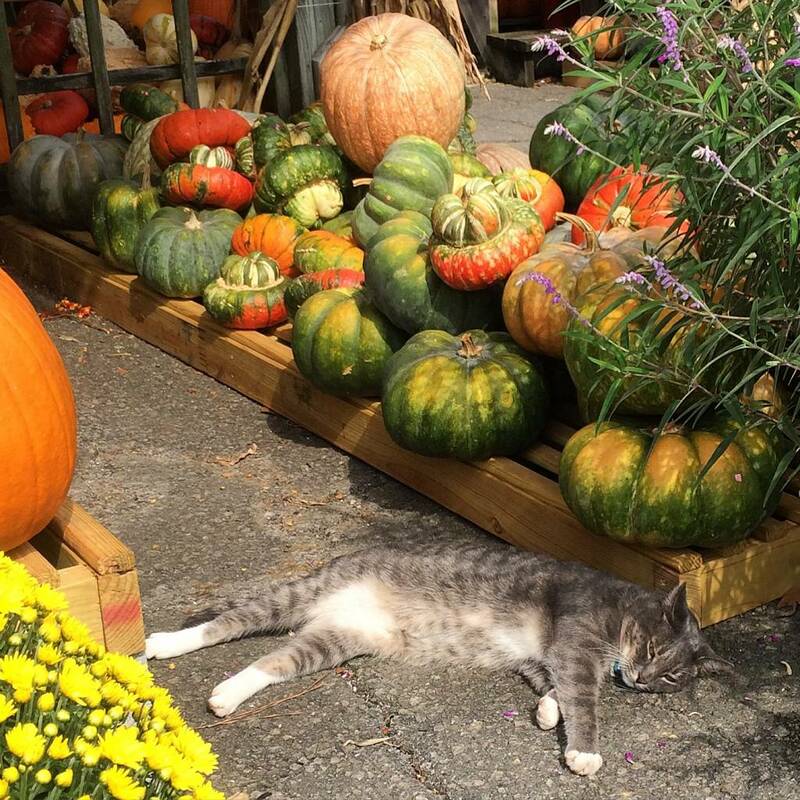 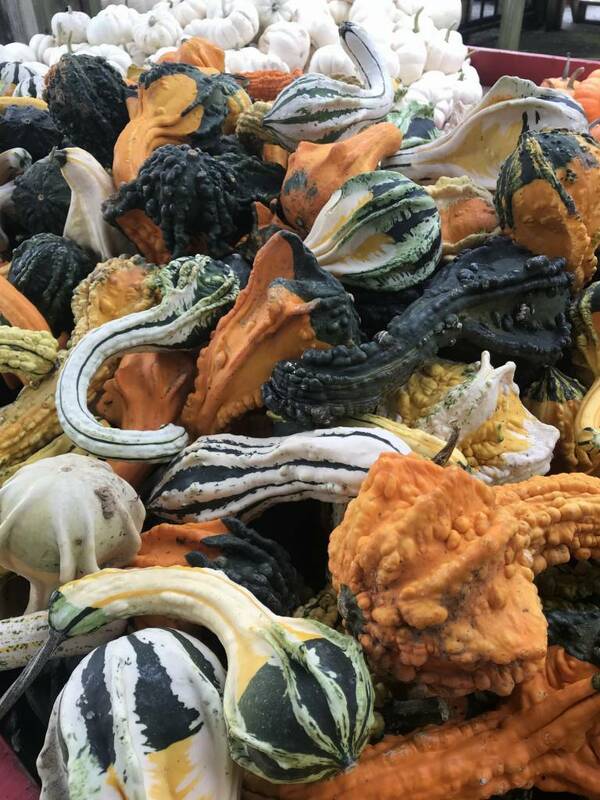 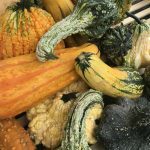 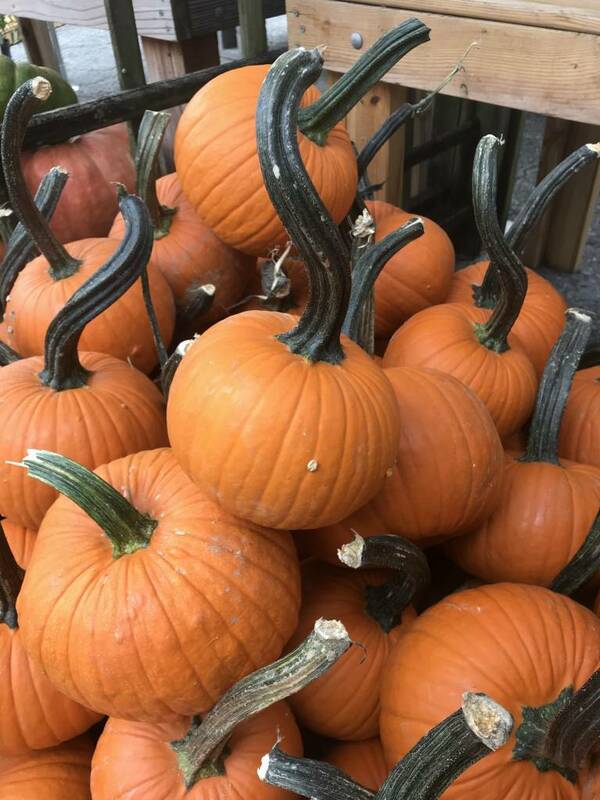 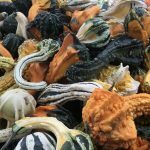 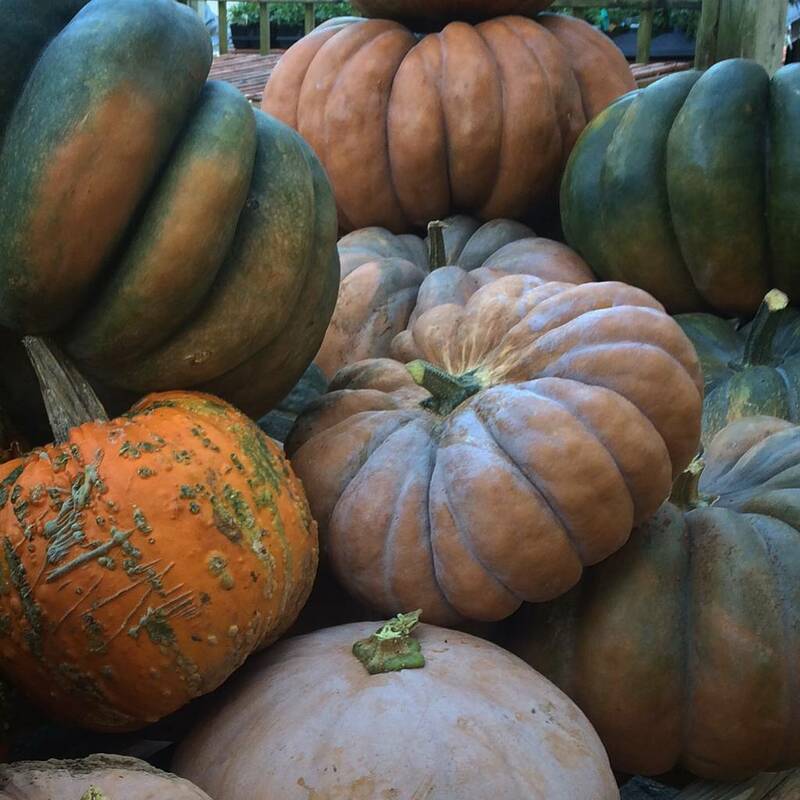 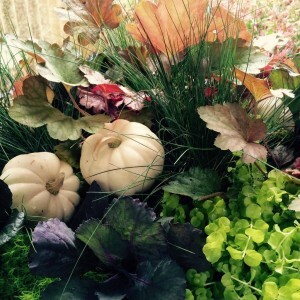 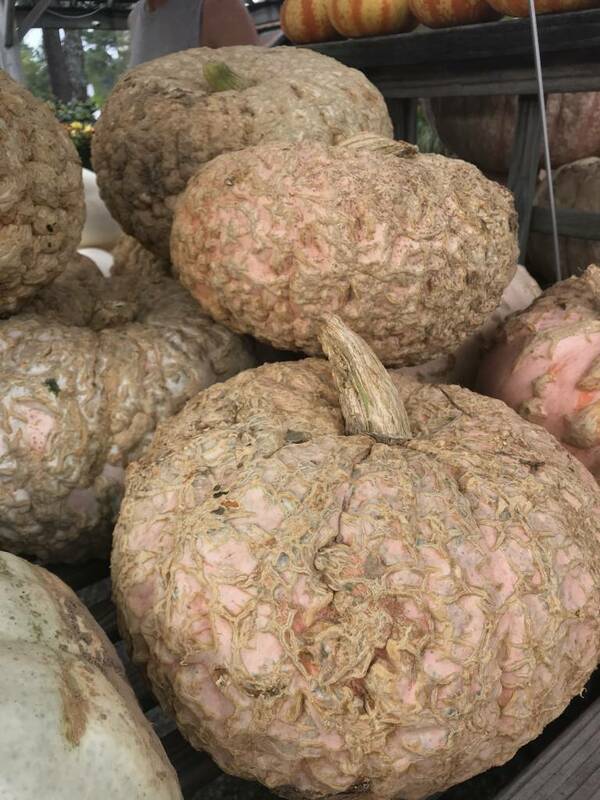 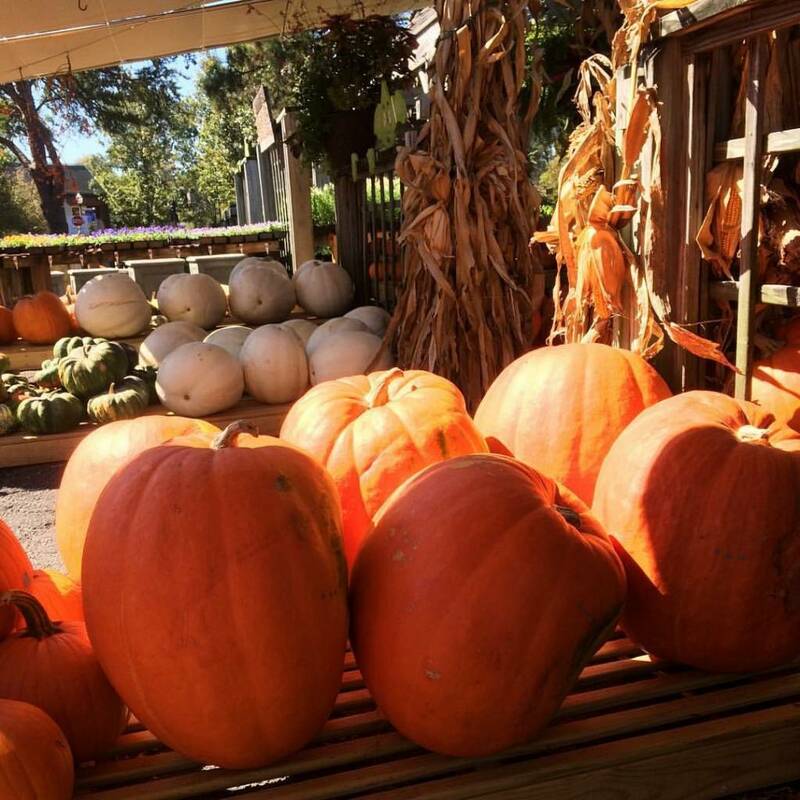 Pumpkins, Gourds and More, Oh My! 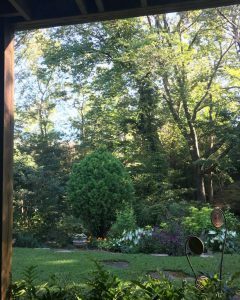 Just when you think summer’s heat won’t ever let up, along come a few days of cooler temperatures and clear blue skies to lift spirits and give all of us a second wind. 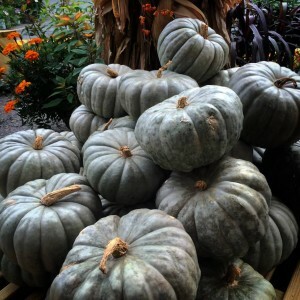 Summer’s final gift to us is the bounty of the late season garden – pumpkins! 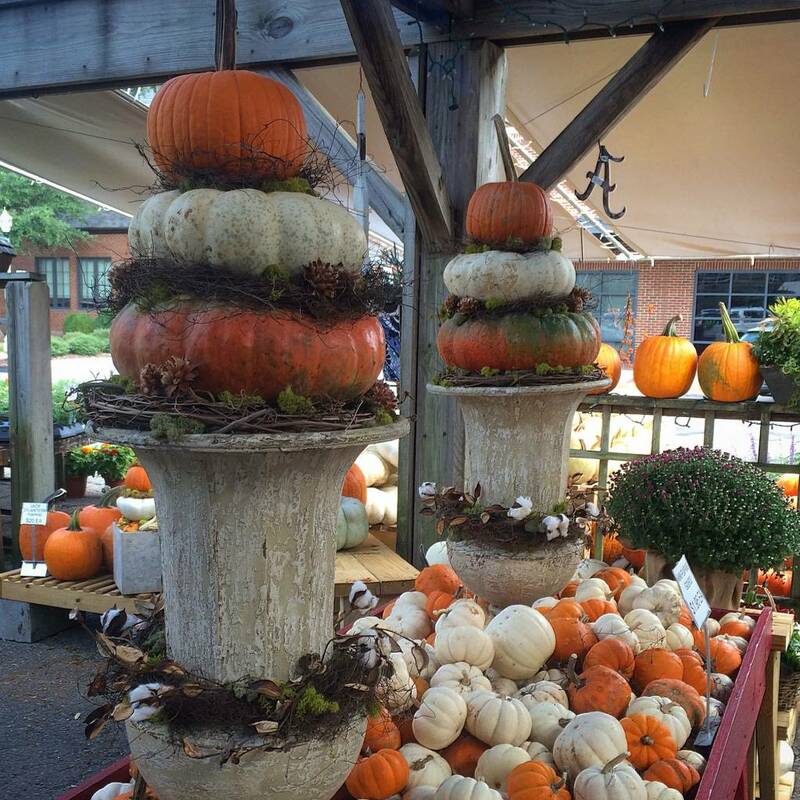 Oh, but not just any old pumpkins (Though we wouldn’t ever put down the good old fashioned jack-o-lantern!). 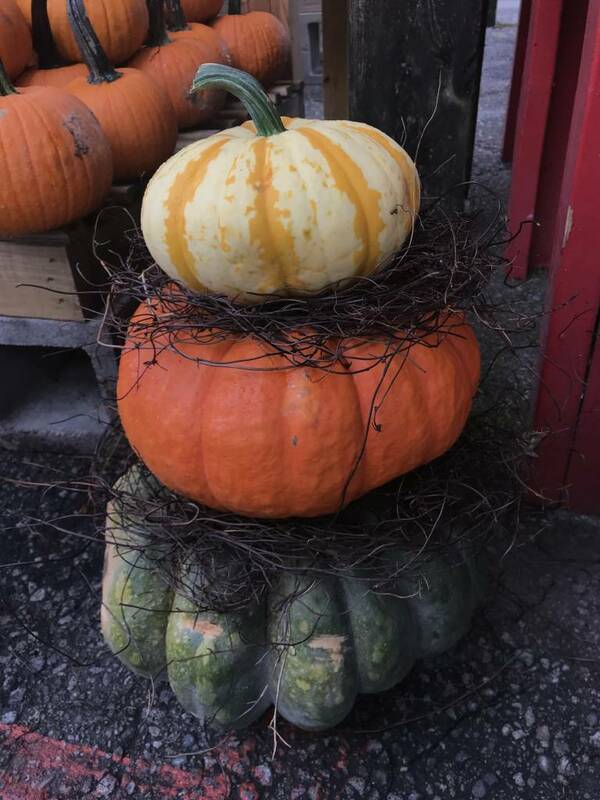 The last few years the ubiquitous orange pumpkin has made some fancy friends, with names like Blue Hubbard, Cinderella, Long Island Cheese, Jharadale, Lumina, Lunch Ladies (Yes, really!) 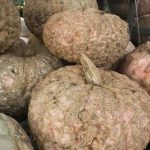 and Warty – just to name a few. 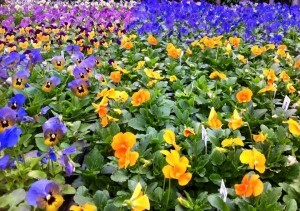 But, really the names don’t matter, because what’s in a name when they’re all so wonderfully different? 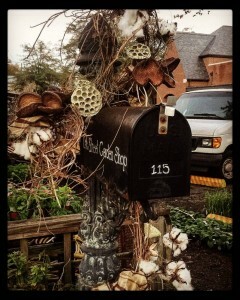 The entrance is looking so pretty! 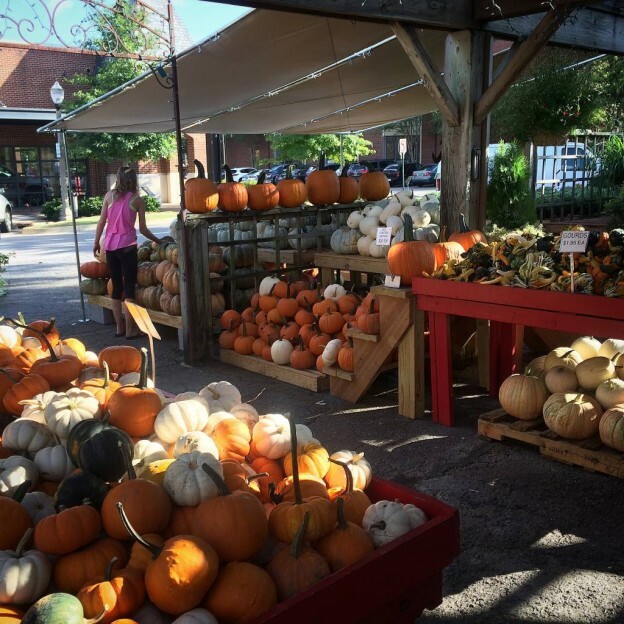 The entrance to the shop will be filled with the pick of the crop – picked just prior to delivery from a 20 acre farm in Tennessee. 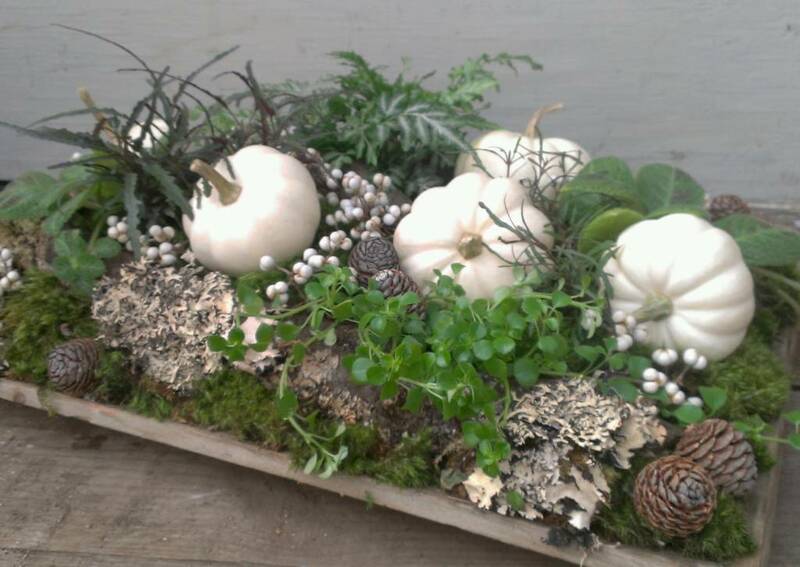 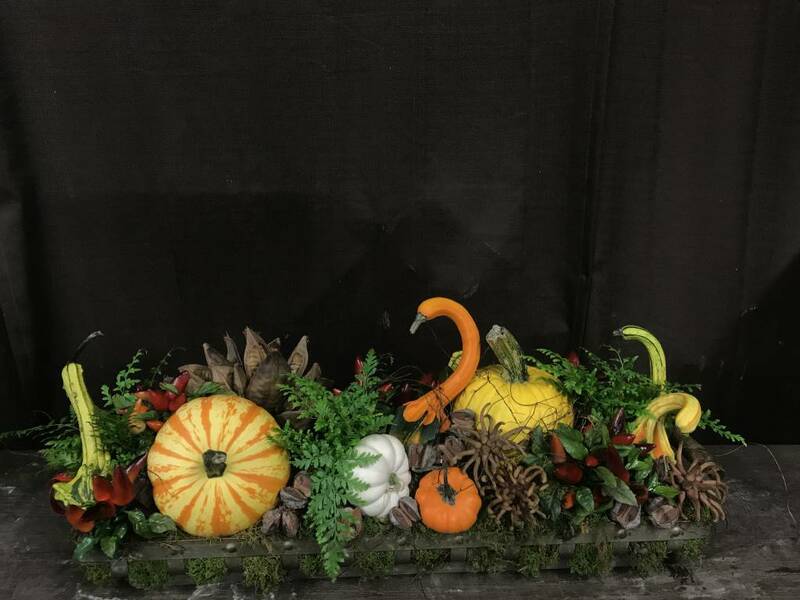 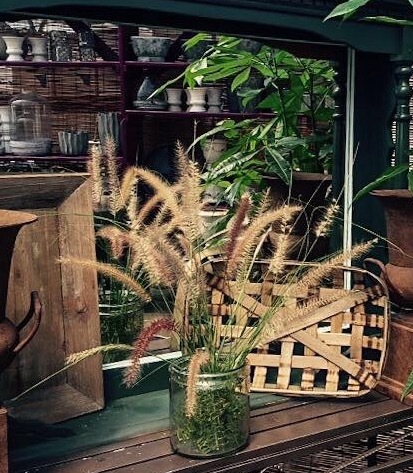 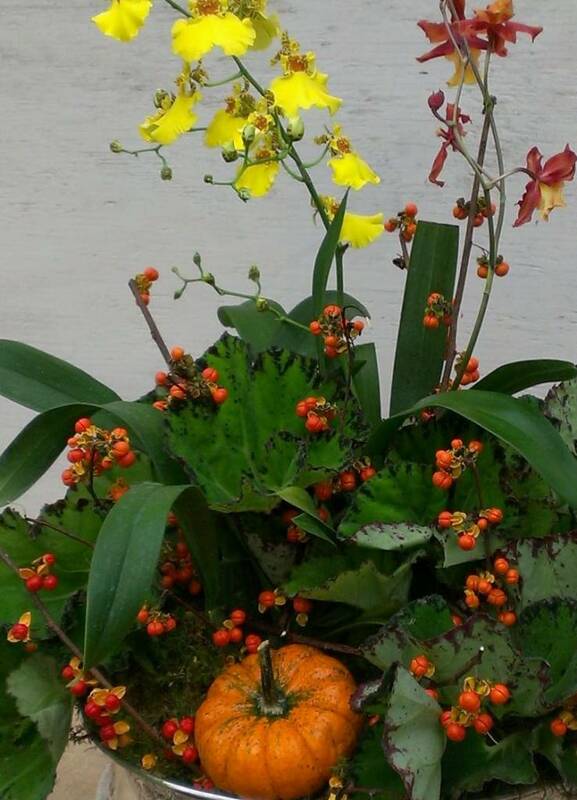 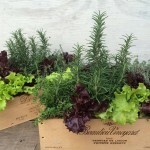 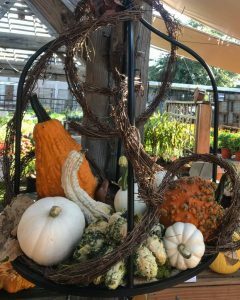 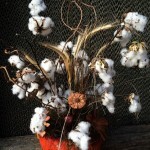 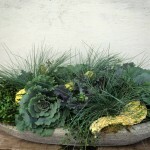 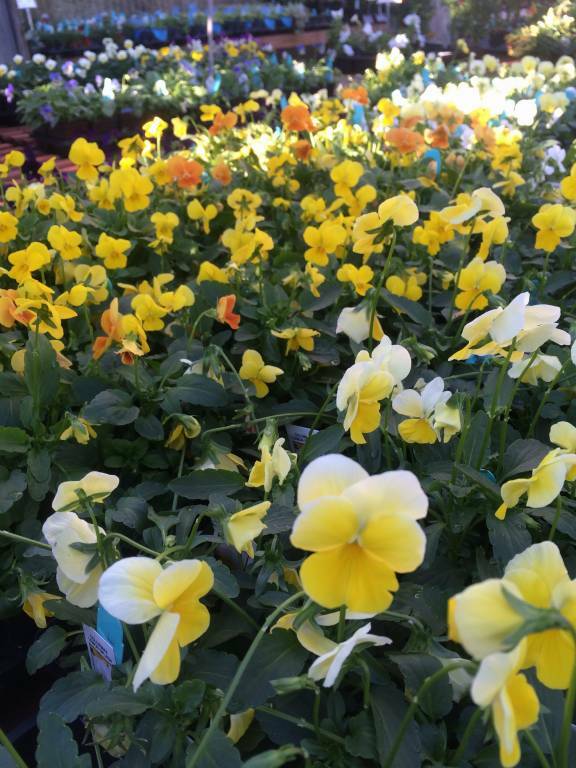 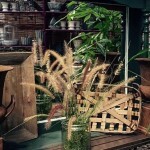 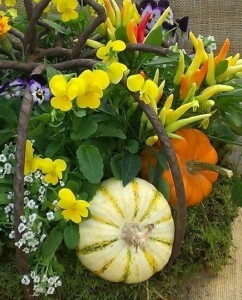 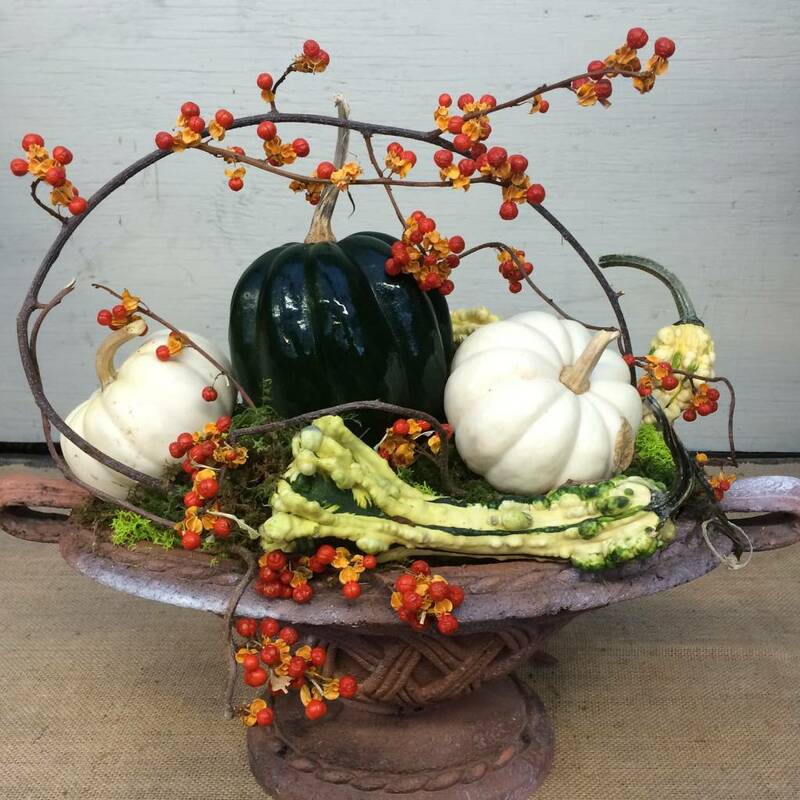 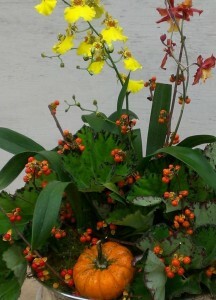 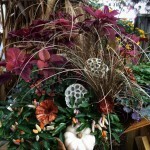 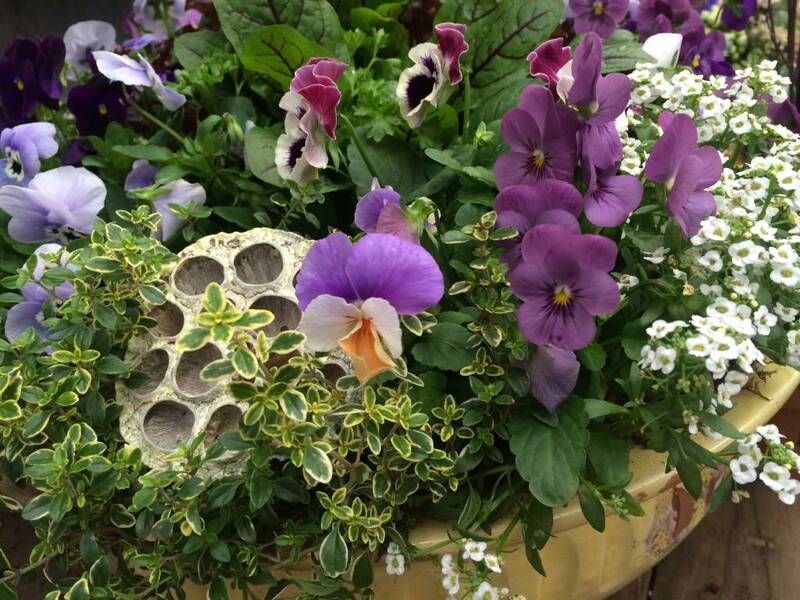 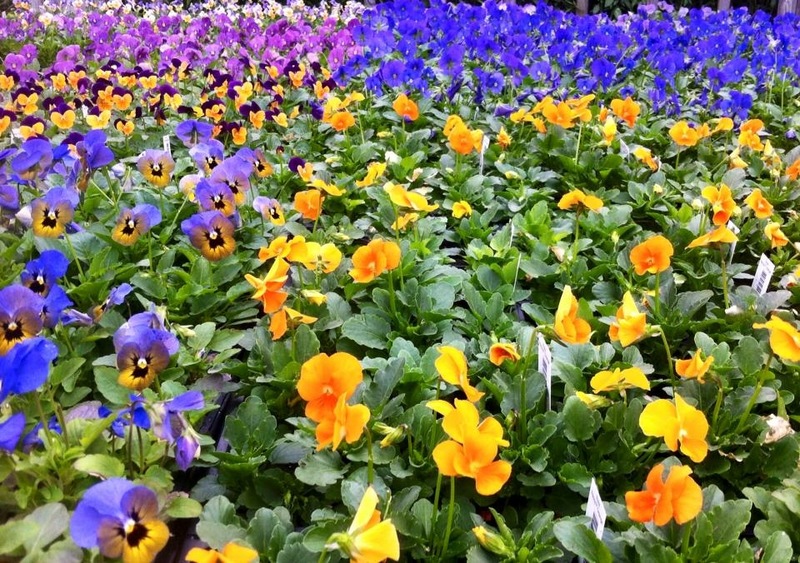 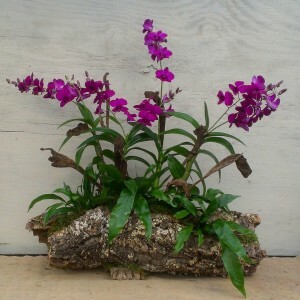 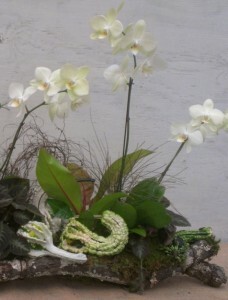 We’re excited about the fall harvest this year and hope you’re making plans for pretty fall displays at your homes too! 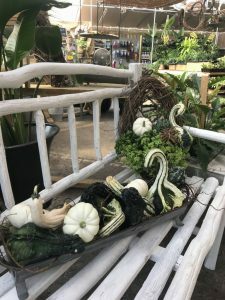 Making an appearance this year, among the pumpkins, fall flowers and cool season vegetables, are our original handmade Halloween friends from many years past. They include gremlins, ghosts, a big orange pumpkin, a black cat and a scary old witch with her cauldron. 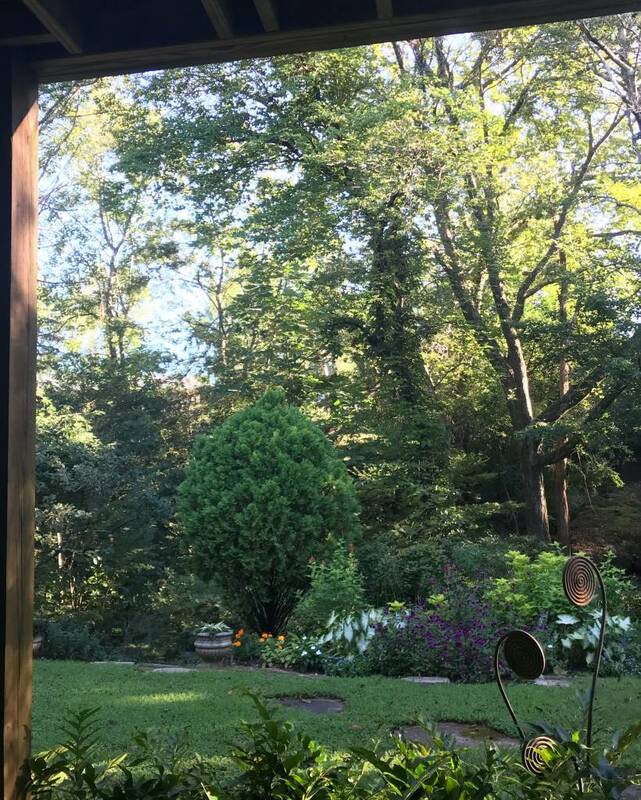 It’s fun having them back! 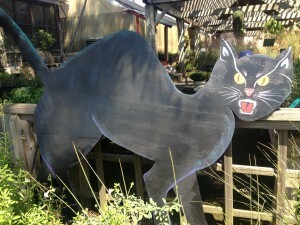 A big thank you to Jamie, Molly and Pinkie for their fantastic makeover work on all of them – they look better than ever! 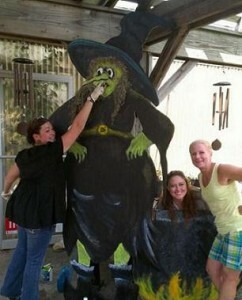 Molly, Jamie and Pinkie with our witch! 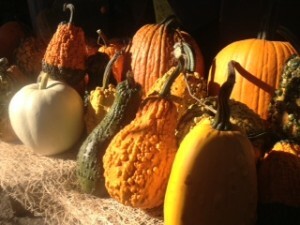 Pumpkins and Halloween decorations are ready made backdrops for pictures, too. 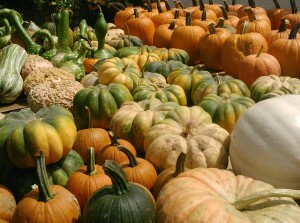 So make yourself at home, and take as many photos as you’d like of your little “pumpkins” with ours! 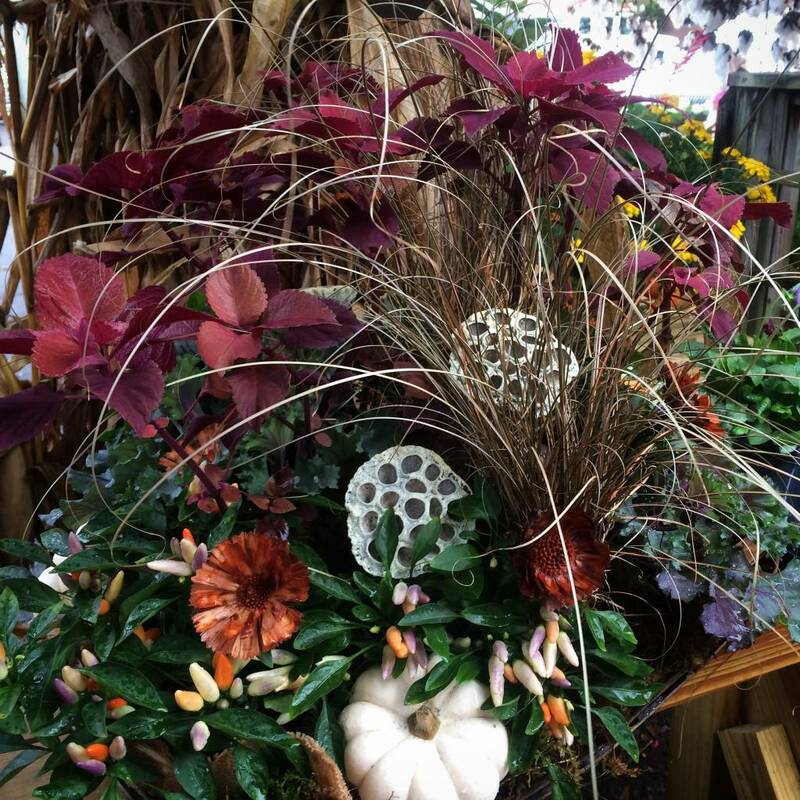 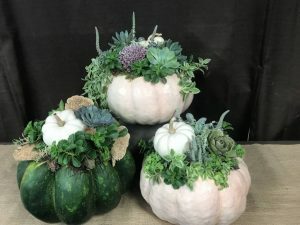 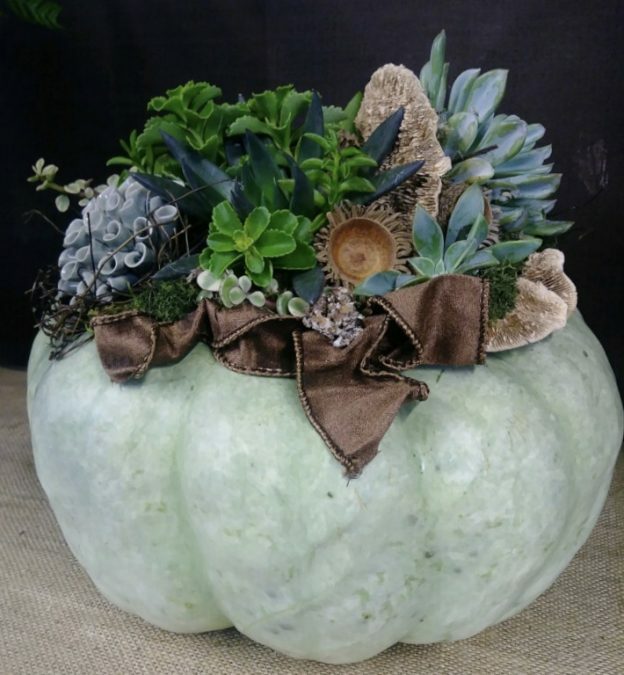 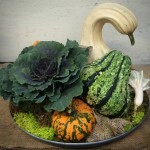 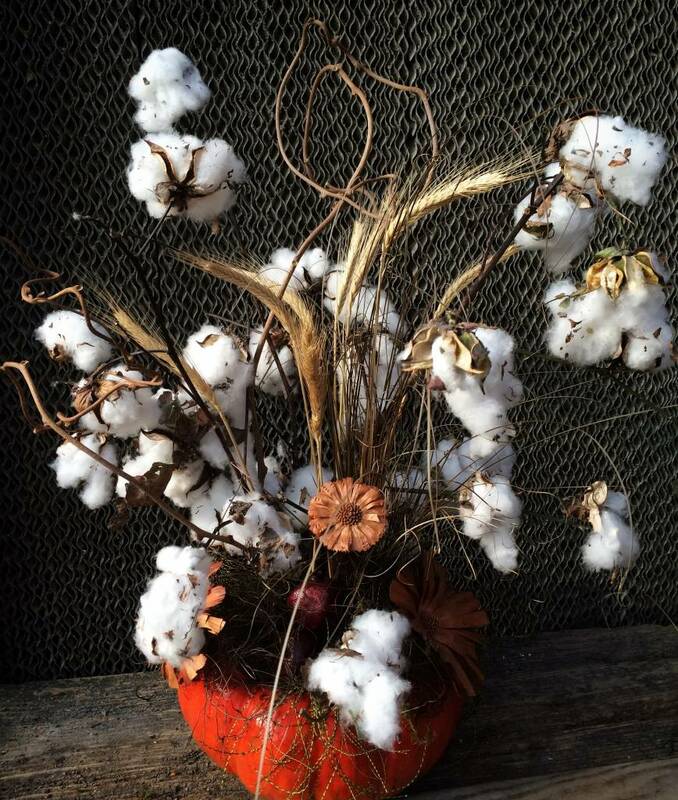 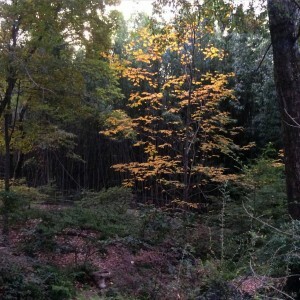 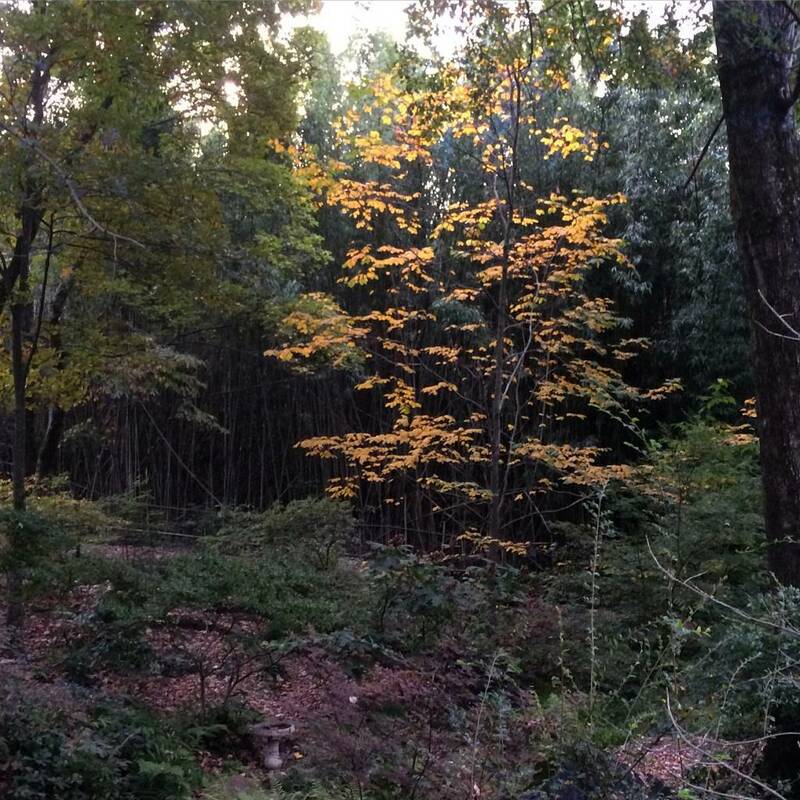 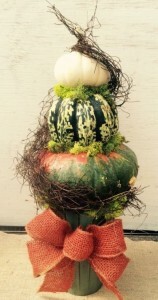 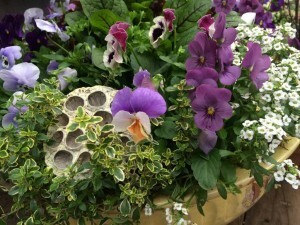 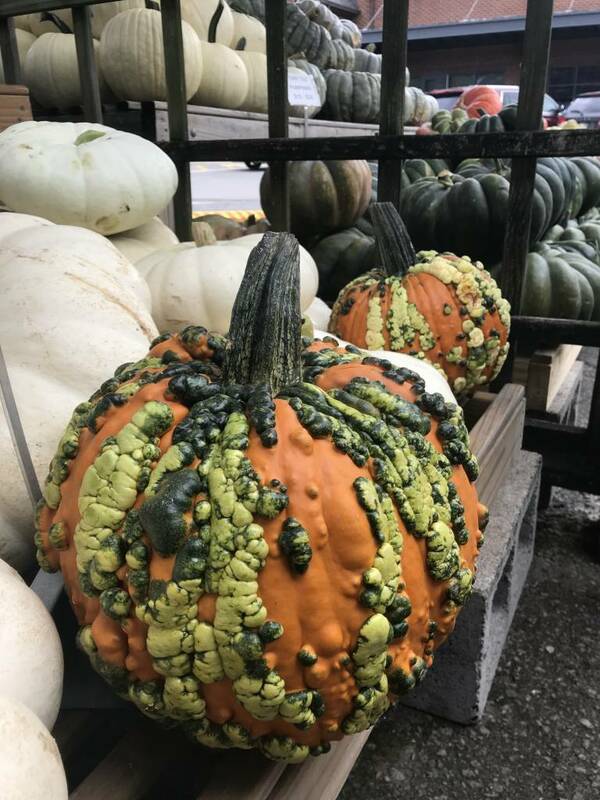 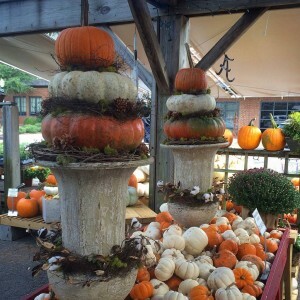 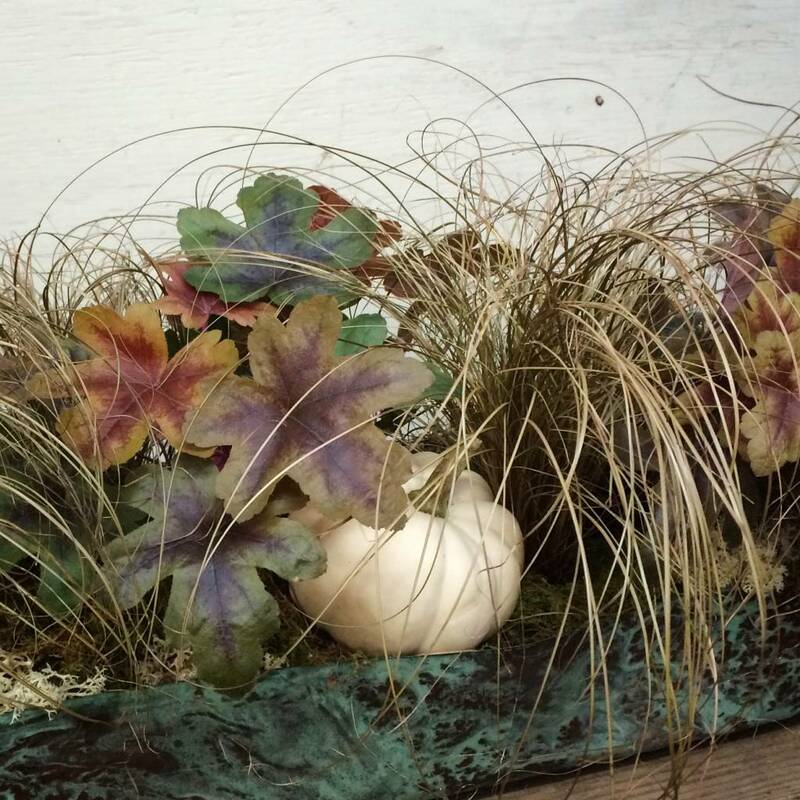 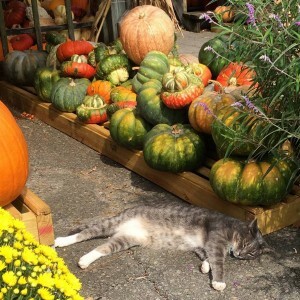 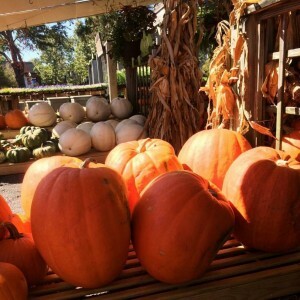 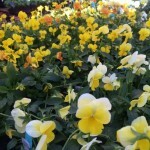 This entry was posted in Fall, Holiday, Pumpkins and tagged decorating with pumpkins, fall decorating, gourds, halloween, holiday on September 23, 2013 by Kris Blevons.